I have been threatening for a long time to write a series of technical articles to educate consumers and to dispel misconceptions that exist about automotive after-market technology. Motivated by problems with customer's cars resulting from the installation of power pulleys, I wish to explain the potential dangers of these products and address the damage they cause to engines. 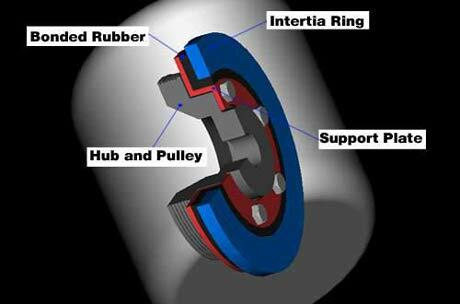 The theory behind the power pulley is that a reduction in the speed of the accessory drive will minimize the parasitic losses that rob power from the engine. Parasitic power losses are a result of the energy that the engine uses to turn accessory components such as the alternator and water pump, instead of producing power for acceleration. In an attempt to minimize this energy loss, many companies claim to produce additional power by removing the harmonic damper and replacing it with a lightweight assembly. While a small power gain can be realized, there are a significant number of potential problems associated with this modification, some that are small and one which is particularly large and damaging! The popular method for making power pulleys on E36 engines is by removing the harmonic damper and replacing it with a lightweight alloy assembly. This is a very dangerous product because this damper is essential to the longevity of an engine. The substitution of this part often results in severe engine damage. It is also important to understand that while the engine in a BMW is designed by a team of qualified engineers, these power pulleys are created and installed by people who do not understand some very important principles of physics. I would first like to give a brief explanation of these principles which are critical to the proper operation of an engine. Though it is common belief that large steel parts such as crankshafts are rigid and inflexible, this is not true. When a force acts on a crank it bends, flexes and twists just as a rubber band would. While this movement is often very small, it can have a significant impact on how an engine functions. All objects have a natural frequency that they resonate (vibrate) at when struck with a hammer. An everyday example of this is a tuning fork. The sound that a particular fork makes is directly related to the frequency that it is vibrating at. This is its "natural frequency," that is dictated by the size, shape and material of the instrument. Just like a tuning fork, a crankshaft has a natural frequency that it vibrates at when struck. An important aspect of this principle is that when an object is exposed to a heavily amplified order of its own natural frequency, it will begin to resonate with increasing vigor until it vibrates itself to pieces (fatigue failure). Fatigue failure is when a material, metal in this case, breaks from repeated twisting or bending. A paper clip makes a great example. Take a paper clip and flex it back and forth 90° or so. After about 10 oscillations the paper clip will break of fatigue failure. The explanation of the destructive nature of power pulleys begins with the two basic balance and vibration modes in an internal combustion engine. It is of great importance that these modes are understood as being separate and distinct. 1) The vibration of the engine and its rigid components caused by the imbalance of the rotating and reciprocating parts. This is why we have counterweights on the crankshaft to offset the mass of the piston and rod as well as the reason for balancing the components in the engine. 2) The vibration of the engine components due to their individual elastic deformations. These deformations are a result of the periodic combustion impulses that create torsional forces on the crankshaft and camshaft. These torques excite the shafts into sequential orders of vibration, and lateral oscillation. Engine vibration of this sort is counteracted by the harmonic damper and is the primary subject of this paper. Every time a cylinder fires, the force twists the crankshaft. When the cylinder stops firing the force ceases to act and the crankshaft starts to return to the untwisted position. However, the crankshaft will overshoot and begin to twist in the opposite direction, and then back again. Though this back-and-forth twisting motion decays over a number of repetitions due to internal friction, the frequency of vibration remains unique to the particular crankshaft. This motion is complicated in the case of a crankshaft because the amplitude of the vibration varies along the shaft. The crankshaft will experience torsional vibrations of the greatest amplitude at the point furthest from the flywheel or load. The sequence of forces that the crankshaft is subjected to is commonly organized into variable tangential torque curves that in turn can be resolved into either a constant mean torque curve or an infinite number of sine wave torque curves. These curves, known as harmonics, follow orders that depend on the number of complete vibrations (cylinder pulses) per revolution. 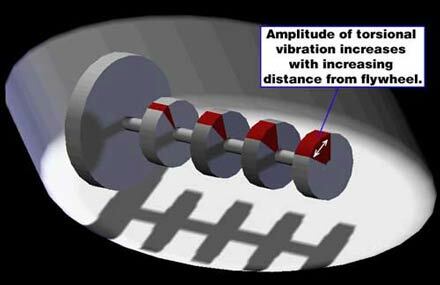 Accordingly, the tangential crankshaft torque is comprised of many harmonics of varying amplitudes and frequencies. This is where the name "harmonic damper" originates. When the crankshaft is revolving at an RPM such that the torque frequency, or one of the harmonic sine wave frequencies coincides with the natural frequency of the shaft, resonance occurs. Thus, the crankshaft RPM at which this resonance occurs is known a critical speed. A modern automobile engine will commonly pass through multiple critical speeds over the range of its possible RPM's. These speeds are categorized into either major or minor critical RPM's. Major and minor critical RPM's are different due to the fact that some harmonics assist one another in producing large vibrations, whereas other harmonics cancel each other out. Hence, the important critical RPM’s have harmonics that build on one another to amplify the torsional motion of the crankshaft. These critical RPM’s are know as the "major criticals". Conversely, the "minor criticals" exist at RPM's that tend to cancel and damp the oscillations of the crankshaft. Crankshaft failure can be prevented by mounting some form of vibration damper at the front end of the crankshaft that is capable of absorbing and dissipating the majority of the vibratory energy. Once absorbed by the damper the energy is released in the form of heat, making adequate cooling a necessity. This heat dissipation was visibly essential in Tom Milner's PTG racing M3 which channeled air from the brake ducts to the harmonic damper, in order to keep the damper at optimal operating temperatures. While there are various types of torsional vibration dampers, BMW engines are primarily designed with "tuned rubber" dampers. Our motto at Dinan is "Performance without sacrifice" We feel our customers expect ultra high performance along with the legendary comfort and reliability of a standard BMW. While it is common that a Dinan BMW is the fastest BMW you can buy, performance is not our only goal. Dinan isn't just trying to make the fastest car. Instead a host of considerations go into the development of our products. Dinan puts much more effort into these other areas than does our competition.